The famous parable traditionally known as the Parable of the Prodigal Son (Lk. 15:11–32) is the quintessential illustration of pre-emptory forgiveness, one that closes the case on Jesus’ teaching on vengeance and forgiveness. 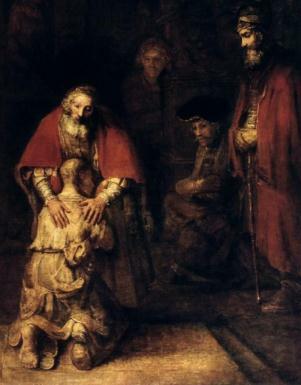 This parable is better called “The Parable of the Prodigal Father and His Two Sons.” The opening of the parable draws a triangle: “There was a man who had two sons.” We expect tension out of a triangle, and we get it right off the bat when the younger son asks for his share of the property. The father accedes to his son’s request (demand?) and the younger son goes off with the proceeds. The elder son stays at home with his share of the property, at least geographically. What kind of father would be so foolish? Why would a young man leave a father who would give him whatever he wanted? Was it to get away from his brother? The stories about paired brothers in Genesis predispose us to suspect that the two brothers are mirror images of each other. The parable goes on to say that the younger son “squandered his property.” Literally, he “scattered his substance.” That is, the younger son, while trying to forge an individual selfhood separate from his father and brother, completely loses himself in dissolute living. Geographical distance has not freed him from continuing to be a mirror image of his older brother. Then comes a famine and the social crisis that comes with it. Chances are that the scarcity was magnified by created scarcity. In such a social crisis, there must be a victim. A foreigner is particularly vulnerable to being a victim in such a crisis. The younger son fit the bill perfectly. He was deserted by everybody, in spite of all the money he spent on his women and carousing friends. Nobody was willing to take him in. He ended up as a servant who feeds the pigs (an unclean animal for Jews) and “no one gave him anything.” In this desperate situation, the younger son recalled how well-fed his father’s servants were, and he “came to himself.” Perhaps it was embarrassment that made him want to return as a servant, but perhaps he also didn’t want to re-enter the triangle with his father and brother. The father’s ecstatic reception of the lost son and subsequent celebration blows apart the family triangle, leaving no room for mimetic strife. In contrast to the mimetic process that organizes society around a dispensable victim, the indispensable victim who is no longer lost has been found. The elder son, however, wanted to preserve the old triangle. His sour attitude suggests that he still needs to have his younger brother live irresponsibly. The elder brother’s universe would collapse if his younger brother began to play a responsible role in family affairs. No wonder the younger son ran away from a brother like that! We are likely to judge the younger brother for his callous irresponsibility and the elder brother for his amazing insensitivity. But if we do that, we find ourselves ensnared in the mimetic struggle between the two brothers, comparing them and taking sides until our own capacity for love is obscured and our capacity for celebration fizzles. The Prodigal Father does neither. He does not upbraid the younger son for leaving; neither does he upbraid his elder son for being such an insufferable prig. He only invites both of them to the party. Most of us have a hard time even wanting to be a father like that! The parable ends with this challenge of forgiveness and unconditional love: Do we rise to the challenge of the Prodigal Father and renounce our irresponsibility and self-righteousness? This entry was posted in Gospel, mimetic desire, nonviolence, peace, René Girard, spirituality and tagged brothers, fathers, forgiveness, Gospel of Luke, Jesus, mimetic theory, nonviolence, parable of the prodigal son, parables, parables of Jesus, peace, prodigal son, René Girard, repentance, sons, spirituality by andrewmarrosb. Bookmark the permalink. This is wonderfully dense with meaning and possibility. It assumes a background my parishioners don’t have. I would like to expand it out by explaining the concepts it assumes we understand and so make it a full length sermon in my setting. We used to talk about triangles in family systems theory and knew it was very helpful. Girard’s theory takes us further and provides an interpretive matrix that explains anthropological foundations of human behavior and God’s response. Theology and anthropology. If I take your stuff and work with it adapting it to my setting, is that not “Paraclete Theology” in action? We are in a dance mirroring the Trinity and there is much joy in it. We are in positive mimesis and advocating for each other and all of us for our Lord. Often the Rembrandt painting is reduced to only the figures of the father and son and therefore miss the depth of the artists insight. Fr. Andrew, Thank you for this. Have you read Kenneth Bailey on this parable?